S&A is excited to co-sponsor an evening of learning and networking with DevelopSpringfield, M&S Development, and CNU New England. Please join us April 10th for the following presentation: TRANSFORMING DOWNTOWNS – Combining urban design with economic strategies to rebuild downtowns, and a *bonus* workshop: PROJECT PRO FORMA WORKSHOP. Please join panelist, Bob Stevens for the Southern Vermont Housing Summit on February 9th in Shaftsbury, VT.
Hamilton (Ham) Hodgman, PE and Project Manager for Stevens & Associates will be presenting at IBC Training January 24. This seminar will focus on IBC Chapter 17 Special Inspections in Vermont. Ham’s session will cover the areas of Reinforced Concrete, Structural Steel, and Fire Proofing for primary building systems. S&A Architect, Alan Berry is looking forward to attending the Traditional Building Conference December 5th & 6th in Brooklyn, NY. 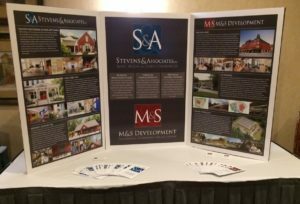 Stevens & Associates and M&S Development are proud sponsors of the 2017 Vermont Development Conference. On November 14th, please join us along with over 275 design, development and real estate professionals for a full day of networking, seminars, and workshops. Tickets are going fast. Please join Bob Stevens as he presents: Financing for Projects that Don’t Pencil Out – LOCUS: Smart Growth America Webinar at 1:00 PM on November 7th. On October 10th, Stevens & Associates, M&S Development and DevelopSpringfield will co-sponsor an evening for design, planning and development professionals to meet up and learn about the principles of New Urbanism. The goal is to discover how we can rebuild the fabric of place in New England one project at a time. Please visit HERE for registration and program information. Join Bob Stevens for the Catalyst of the Climate Economy event on September 6th as he moderates the panel discussion for “Building of the Future: Low Carbon Solutions in our Built Environment”. Join Bob Stevens as he presents at the AARP and VNRC’s Smart Growth Summit at Champlain College on June 16th during the Small Group Discussions – Experts Explore Smart Growth Solutions session. Stevens & Associates, M&S Development and DevelopSpringfield are co-sponsoring an evening for design, planning and development professionals to meet up and learn about the principles of New Urbanism. The goal is to discover how we can rebuild the fabric of place in New England one project at a time. Community interest and support was evident last night as Bob Stevens and other developers presented detailed plans for the Putnam Block Redevelopment Project in Bennington, Vermont. Bob Stevens, President of S&A and Principal for M&S Development will present with Craig Miskovich, Esq. and Principal for M&S “Financing Projects That Don’t Pencil Out” at the 2017 Main Street Now Conference on May 2nd in Pittsburgh, PA. The staff at Stevens & Associates is proud to volunteer at the Sophomore Career Summit on April 26th, and offer students an opportunity to attend workshops focused on careers in engineering and architecture. This event will host approximately 300 students from Windham County. Please read more about the summit at The Commons Online.